Corey contacted us last week asking about website services. 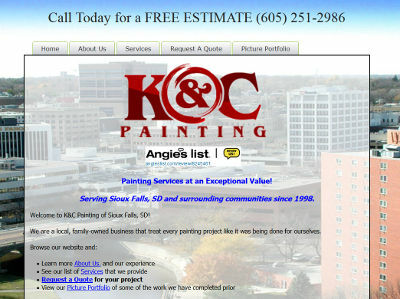 He is a partner in the K&C Painting business located in Sioux Falls, SD. He wanted to establish an online presence for his business to try to increase sales for his paint contracting business. After receiving the initial information and pre-payment, we worked closely with Corey to get the site going quickly. In about four days, we had the website fully completed and published! We appreciate the business from Corey, he he is happy with the service we provided. He has also decided to have us do some pay per click (PPC) advertising. The K&C Painting website is at sfsdpainting.com.